Last week was a busy one. For P-day I went and finally road a ferry. Also had the best gaak jai bang in hong kong. Gotta love mammies pancakes. It was a good day with a few upsets. One of the sisters got her card eaten in the ATM. But it was good times. Today we will be riding the worlds longest escalator. Aaron has made some amazing progress we met him on Tuesday and then went to a dinner appointment. He is really set on serving a mission so he wants to help us teach and go finding. That night we decided to have him share the spiritual thought it went so well. The thought and impression really came to us that he is so ready now that we have no reason to wait until the 27th to baptize him. So we have moved him to this Sunday. He is more than happy. Its also really cool because he wants the Bishop to baptize him and the first counselor to do the confirmation. Its such a great way to get the members involved with these converts. An amazing miracle has also happened on this very same day after teaching another investigator we heard a knock on the church door. Can it be that baptism are knocking on our doors? Well it just so happens that a lady feels very strongly that she must be baptized in our ward. She also wants her daughters family to be as well. So she came to english class than to church with her daughter and her kids and after church we taught them the first lesson and it went so well. That have committed to coming to church every week! The young men in the ward have also stepped up their game. They showed up to church with two investigators that we have taught previously. 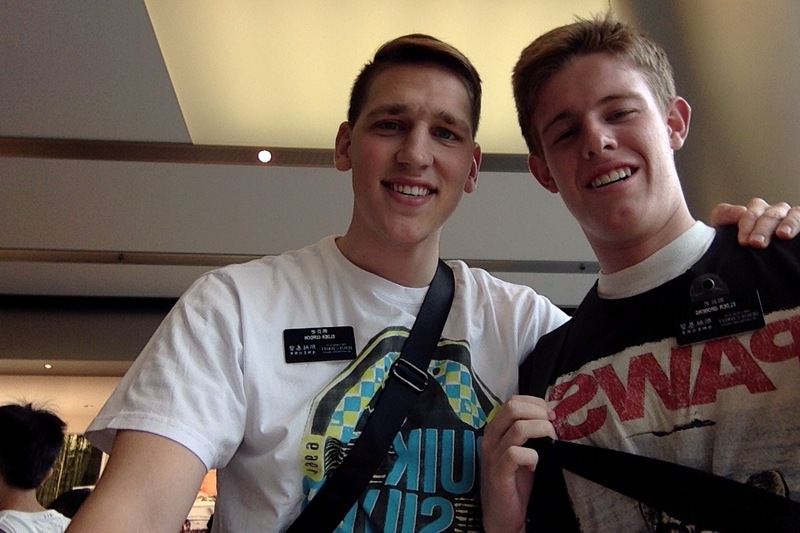 Its great to see these boys start doing some missionary work. Cheui HD (*editors note: HD means something similar to brother, so it would be Brother Cheui) a ward missionary also brought his dad, sister, and his sisters friend to church. We scheduled them for english class! Heui HD also brought a relative to church He seemed to enjoy himself. Things are going really really good here in the Butterfly Ward. Its crazy for me to think anyone ever could dislike this ward. Also I got an amazing opportunity to attend the temple and man probably one of the best sessions I have ever had I am still on cloud nine! Who knew missionary work could be so INTENSE!!! Well this week was truly a terrific week! So many great things happened and I have been blessed beyond measure. Anyone who thinks of their mission as a sacrifice doesn’t understand the bigger picture. It seems like there is this attitude of referring to missions as a sacrifice, but I never could even from the very first hour of my mission. Looking back I can’t help but just laugh at how I thought I knew the blessings that would come from a mission then, but oh how my mind as been opened to the beauties and blessings of the Gospel. I can’t wait to laugh at myself again 6 months from now. OH HOW BLESSED I AM TO BE HERE! I wish all of you could be experiencing this as well. On that same note, thank you Mom and Dad, Grandma and Grandpa, and my home ward, along with anyone else I have forgotten, for making sacrifices in your lives so that I could have this experience. The experience I want to highlight this week was a lesson with the wonderful Lily. She is the 17 year old sister of Hugo, a recently reactivated member. My wonderful companion found them street contacting back in September and has been teaching them ever since. On Friday we felt that it was finally time to get her to commit to a baptismal date. They have tried in the past, but she always said that she wasn’t ready. Our last few lessons have all been really powerful and we just knew that the time was now. We also knew that it wasn’t going to be easy, and that without the spirit it would be impossible. We started out with some ice-breaking gentile conversation to lighten things up. After a few minutes we got to business by inviting the spirit in with a wonderful prayer. After the prayer we began with our plan of reading Alma 32. When I say that that scripture was perfect, I am serious! There truly could not have been a better chapter of scripture that one at that time for her. It addressed all of her concerns and we knew as we read that the spirit was confirming with her the truthfulness of those words. After reading I transitioned the lesson to our main objective of committing her to a baptismal date by giving a short shpeal (not a word, i know) on the importance of goal setting. She saw right through us and new exactly what we were trying to do. Nevertheless, we pressed on as we talked about how we know that she is ready and that it is within her grasp. I knew that it wasn’t too well received so I called an audible and told her that what we are going to do is to have everybody close there eyes for thirty seconds and just feel the spirit in the room, and then I would read to her the baptismal covenant in Mosiah 18. As we sat in reverent silence the spirit thickened to the point of tangibility. In a hushed voice I read the covenant and then looked her in the eyes and said, “I know you love God, so why not show it to him by committing your life to him.” Elder Hamilton followed up by bearing a powerful testimony and then he introduced the date of Jan. 26 as the day for her to be baptized. She seemed still hesitant and then he said, why don’t you pray about it? She responded with “okay, I’ll do that,” thinking that she was off the hook. Then Elder Hamilton said you should pray about it right now. She surprisingly agreed and said that we should join her. So we all knelt in a circle as she gave a humble and sincere prayer. She even said in that prayer that she knew that what the Elders have taught is true. After the prayer we sat for a few seconds to let her think about the answer she received. After about 5 seconds she was like, alright I know that is what I need to do. OH MAN!! I so excited, but in an attempt to keep the spirit by not shrieking with joy, I just sat there with a grin on my face simply nodding my head in agreement. IT WAS SO GREAT!! Anyway, I hope ya’ll enjoy the story and I hope you have a wonderful Christmas!